For my 100th post on my little blog here, I decided to refresh my background and share an e-mail that I actually submitted for a fun contest... It is no secret that I am in love with Seatbelt Bags.... They are my favorite and I am addicted. 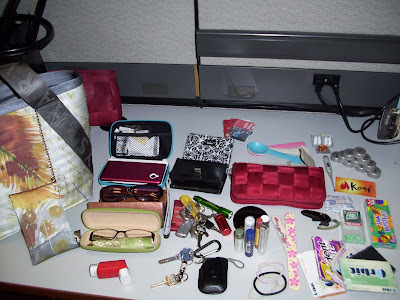 Well, they had a fun post on their blog the other day showing the wife's person and everything she carries in it. Then they asked for similar pictures of our bags... I sent mine in and am still waiting for them to post the top 5... I'm hoping I'm in it, so that I get a HARVEY'S lanyard and coin purse! My Nintendo DSi, my Calvin Klein Sunglasses, my Sigrid Olsen glasses, my inhaler, my digital camera (that's its case - the camera was in my hands... haha), my mass keychain with my desk keys and miscellaneous keys that I don't use a lot (complete with my red bag tag from my makeup bag), my house/safe/car keys, hair ties, my collection of lip glosses (I love lip gloss and am constantly buying new ones), a compact, my red Seatbelt full wallet, a pen in a cloth case (it's kind of popping up from behind the wallet, but it's hard to see), collectable spoons from a yogurt place by my friend's house, old gift cards that I've been meaning to check the balances on, cold medicine, diet coke caps (I always enter the codes and use the points to enter sweepstakes), a thermometer, business card from a Kogi rep I met while waiting for my delicious food (I was trying to set up a time for them to work with my office), bandaids, Jaw Busters (I found these at a gas station and had to have them - my grandma always had them for us when we were kids), tic tacs, my blue tooth, nail files, and my collection of different flavored gums (I always buy new flavors when I see them - but my favorite is the Orbit Sweet Mint on top). I just switched this all back over from my espresso Seatbelt satchel, so I'm missing a few things.... haha Hard to believe.... But I normally have my checkbook, pepcid complete, advil, and excedrine..."
Boo... I didn't win, but I did get honorable mention...... That's something, right? i followed you from the harvey's blog...i love that bag! what kind is it? Wow! Were you a girl scout when you were little? I was and that's why my sisters say I carry everything under the sun. Your bag contents would be perfect for people to close their eyes and "guess what it is"? I do that w/the boys and they love it!